Daisy is a little young to do her own beauty blogging but I'm going to have a good go at writing this for her! Newborn skin is so soft and sensitive and anything that keeps it so smooth and perfect is a winner, obviously. 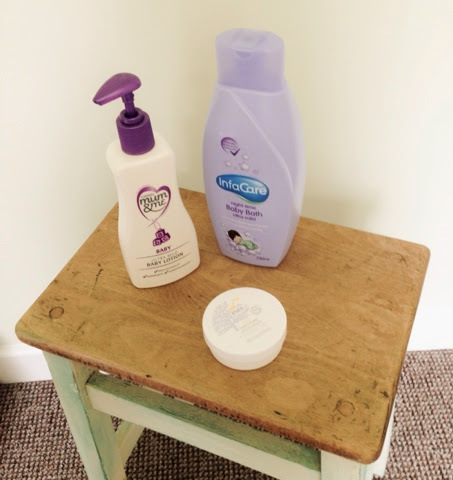 I had a mix of products bought for us when I was pregnant in hampers and at the baby shower etc so it's been great to try different things and really see what works for us and what we like. As part of our night time routine we have bath time, it wears her out, calms her and leaves her smelling beautiful. The first thing I tried was the Johnsons nightime bubble bath, with a touch of lavender. Firstly let me say this smells gorgeous, but sadly this seemed to be quite dehydrating and left not only Daisy with dry skin but also my hands turned very dry and itchy, it's the only thing I can think of that could have contributed. I do use Johnsons though for other things and have had no problems, I think maybe we should give their new gentle range a try out, first touch. 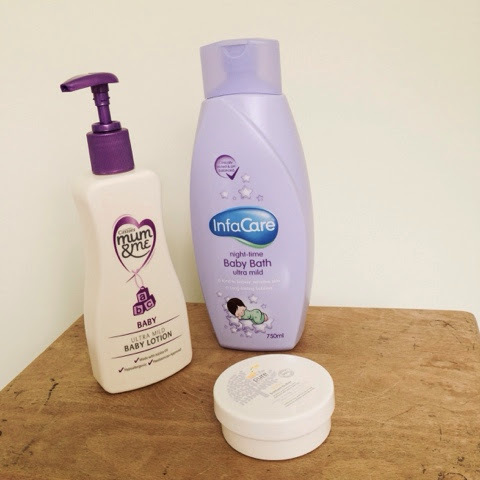 As a result of her dryness I've been using Cussons Mum & Me baby lotion, again this smells delicious. It's non oily and is gentle on Daisy's skin and takes away any scaliness!! It's also lovely for baby massage which I try to do after her bath to relax her a little more whilst looking after her perfect skin. I highly recommend. After a few weeks of using the Johnsons bath stuff I was kindly sent some Infacare baby bath, again this is a night time scent which is perfect for when we bath Daisy. It smells much more gentle and less perfumed than some other brands, and it leaves us both silky smooth. 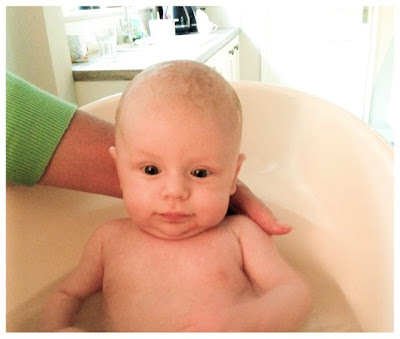 Another thing which I love is that the bubbles stay put for the entire bath time, where as sometimes before by the time I had actually gor her in the bath they'd disappeared! Thumbs up from us! 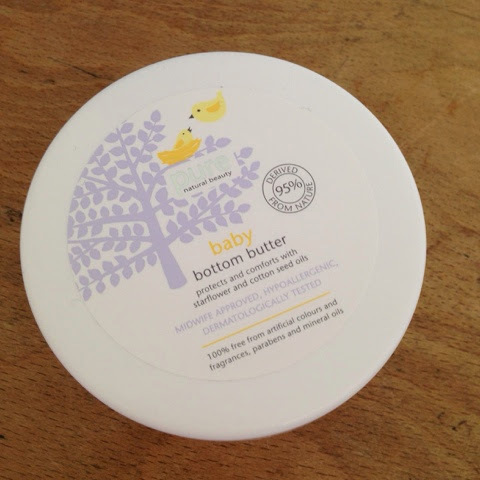 And last but not least I was given an M&S baby care gift set at my baby shower and the one product that has stood out is the bottom butter, it's so silky and even feels nice applying it to her botty feels smooth. It's camomile in it to not only protect but to sooth any soreness too. Perfect!